Cafe Imports World Specialty-Coﬀee Maps are the result of several years’ research, development, design, and vision. 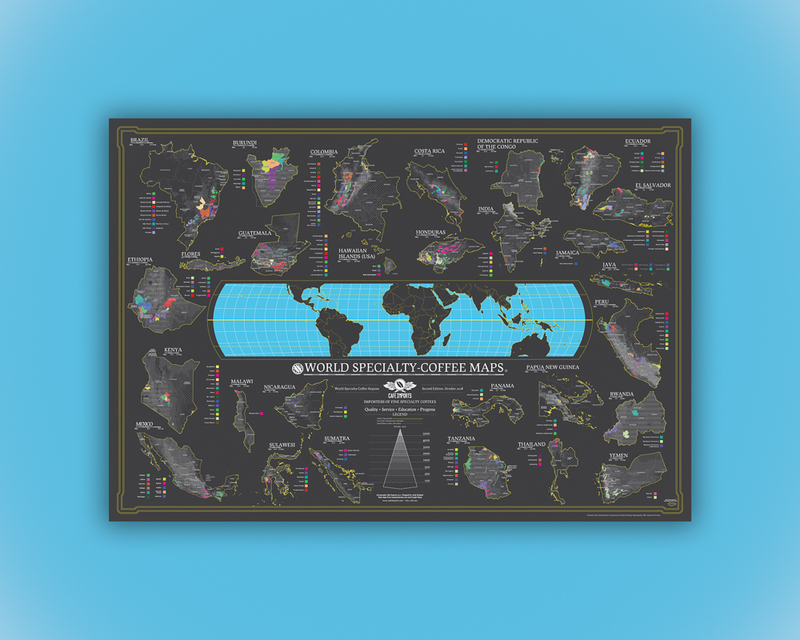 The second edition of this map is an updated and fully edited version of the original Cafe Imports World Specialty-Coﬀee Maps, which was released in in 2017. The updated map features a few additional coﬀee-producing regions and more complete geographical and topographical data, and continues to be a representation of the evolving nature of sourcing partnerships and the changing face of the coﬀee-producing world. The map is a collaborative eﬀort between Cafe Imports creative director Andy Reiland, the Cafe Imports sensory analysis and green-coﬀee-buying teams, and Cafe Imports’ sourcing partners around the globe. 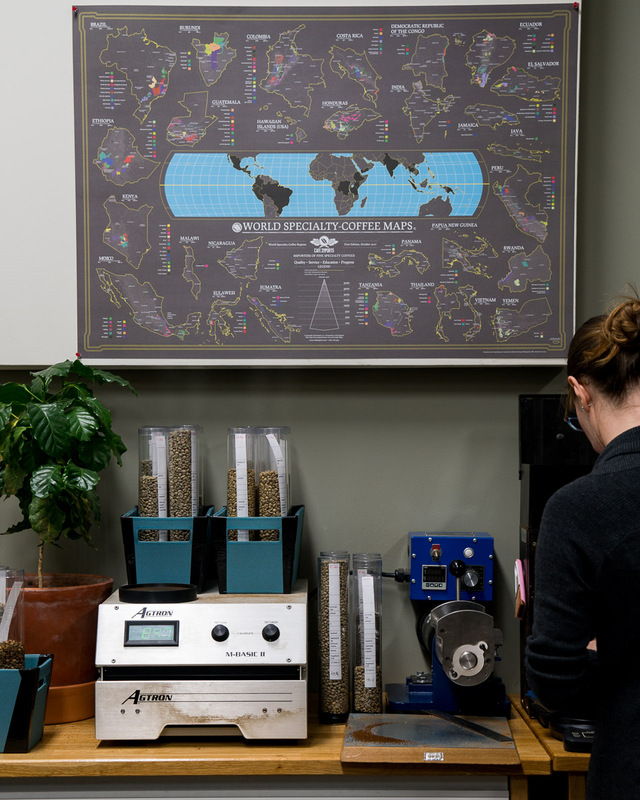 The World Specialty-Coffee Map project began as a novel idea—”Let’s create a map of all the places from which we import coffee!”—that evolved into something much larger. Namely, mapping the world of specialty coffee, at least as we know it. What seemed at first to be a short-lived passion project quickly turned into a full-fledged cartographic journey for our creative director/resident graphic designer, Andy Reiland. Years of development, countless hours of research, hundreds of source materials, and scads of e-mails and phone calls to specialists and experts near and far have led to this moment, and we are pleased to have a map to call our own. We are even more pleased to share this effort with our partners along the supply chain, to give visual insight into the breadth of specialty-coffee production on Earth. 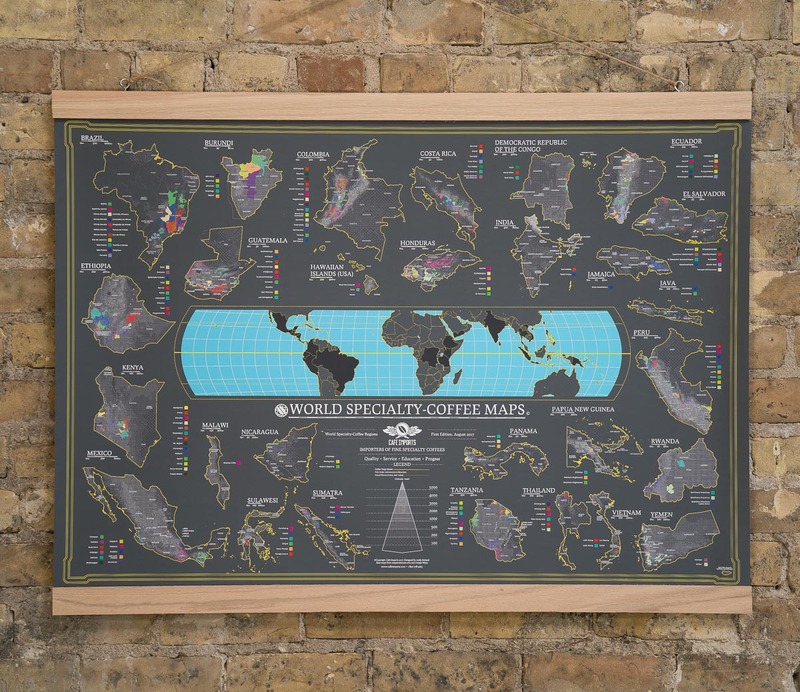 The individual country maps that comprise the larger work each depict specialty-coffee-producing regions from which Cafe Imports has sourced and/or bought coffee, and also reflect the insight and expertise of our partners in the field in those places. In order to meet the challenge of mapping that specialty-coffee world, we needed to establish a methodical process: While mapmaker Andy was diving deep into vectorized topographic world maps, we also consulted with our export partners to ensure the greatest possible accuracy in the information and details presented. A sort of back-and-forth design process was developed as we placed and replaced regions on the map, either as they are determined by political boundaries or more colloquial/local understandings of coffee regions. After the specialty-coffee regional markings were confirmed by our trusted sources, we began to filter each section by altitude range, to more specifically reflect our sourcing philosophies. For this first edition, we painted with relatively broad strokes, filtering the marked regions to depict areas between 1000 and 2999 meters above sea level (masl). For coffee sources farther from the Equator, as in Brazil and Jamaica, we filtered regions to depict areas between 500–2999 meters. Our topographical-mapping tools limit us to depicting macro altitudes of 100, 200, 500, 1000, 2000, 3000 meters, and so on. In future editions of the maps, we plan to refine our altitude ranges to more precise increments. In the meantime, every map has to start somewhere. When it comes down to it, even with all the time, passion, and energy put into them, these maps are just lines on a sheet of paper—they do not have any GPS capabilities, they can’t cup coffees, and they are subject to becoming outdated, as the world doesn’t stop changing just because it’s suddenly depicted in print. For these reasons, while we attempted to paint the world of specialty coffee with broad yet intentional strokes, we realize that opinions (and mileage) on the subject may vary. What defines “specialty” coffee? Why some regions and not others? In order to achieve our dreams of this map, we needed to make many decisions, some of which raise more questions than they answer. We at Cafe Imports intend to continue exploring maps as a communication tool, visually streamlining the language we use for coffee traceability, and providing education about specialty coffee, now with the additional support of geographical references. With this first-edition milestone, we invite open, opinionated conversations that will guide future work: There may be areas we hadn’t considered, or there may be arguments against some of the places we have considered. We welcome feedback and insight about the map that will help us refine and improve future editions: E-mail your thoughts to maps@cafeimports.com. Amendments will be noted in future printings and incarnations of the maps. We intend this first edition to only be the start, and we are excited to see where mapping the world of specialty coffee may take us next. Vectorized base maps were provided by mapinminutes.com. We would like to thank the talented cartographic team of Bob and Sue Harrington for working with us over the course of the maps’ development, and providing us with the most accurate, up-to-date renditions of our world’s complex terrain. Questions and comments can be e-mailed to maps@cafeimports.com.